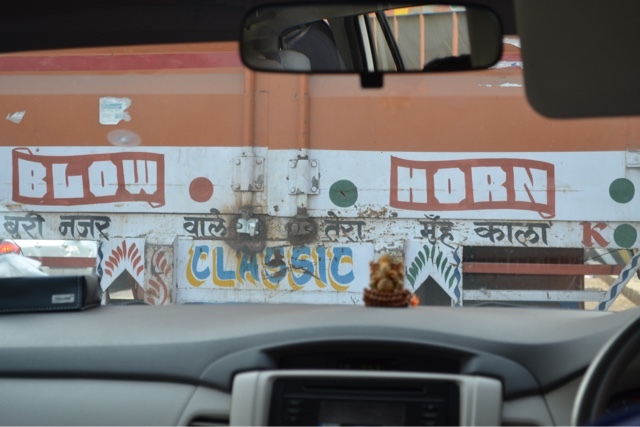 According to our driver, there are three things you need to be able to drive in India: A good horn, good brakes and good luck! I would add that you also need nerves of steel (even to be a passenger!). This charm takes care of the good luck. For the rest you have to hope you have a good driver with a good car! Despite the fact that there is an official driving test (pretty much like ours it seems) no-one obeys any rules or road signs, and it seems that the most important qualifications are to be quick witted and fearless. 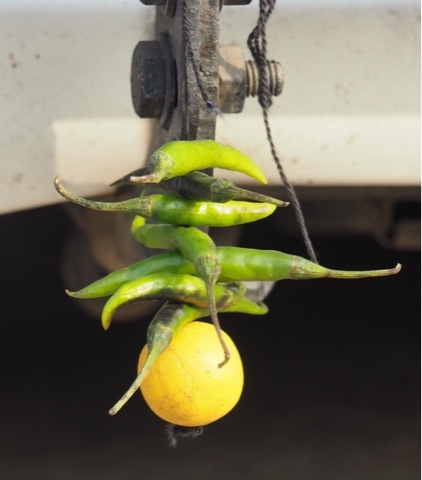 And Ganesh on your dashboard helps too. Major roads are divided into two or three lanes each side of the central reservation with a white line much like ours, but this line is treated as something to drive along rather than as a separator. And if there's the slightest hint of a gap someone will try to fill it so traffic ends up five or six vehicles abreast. 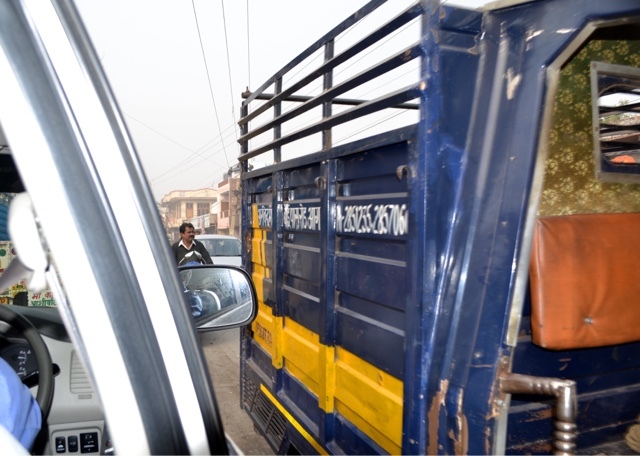 The guy on the motorbike overtook this truck just as it passed us! 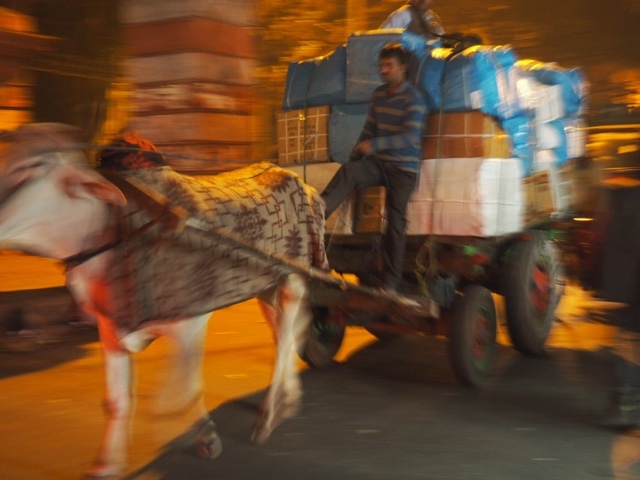 Cars, small trucks, auto-rickshaws, motorbikes, bikes, tractors and trailers, horses, ox-carts, sacred cows, people and dogs all vie for space in an almighty free-for-all. 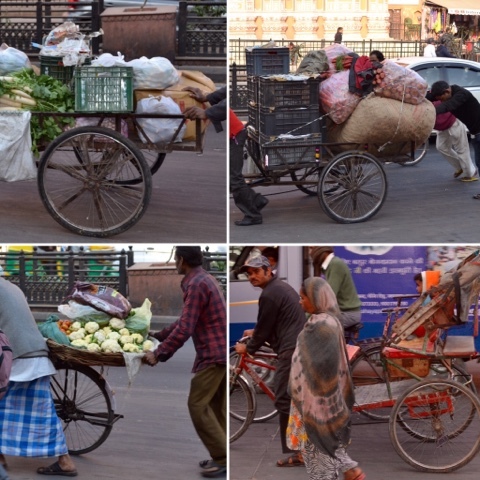 Often there will be an ox cart or someone pushing a hand cart going in the wrong direction on a dual carriageway lane. 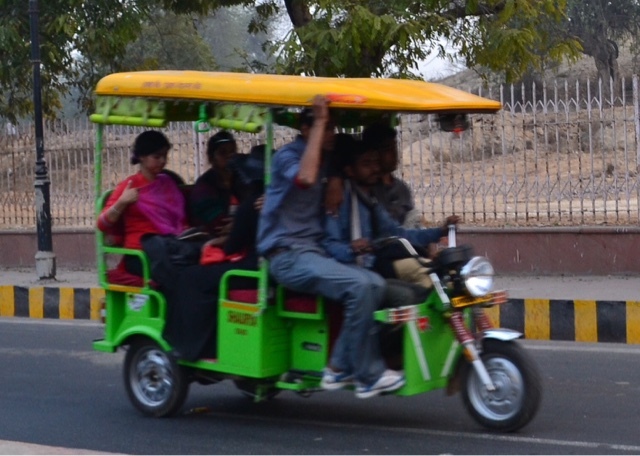 This rickshaw has two extra people in the driver's (single) seat. We saw a six seater minibus with probably six people in the front seat,15 inside and a further 6 standing outside on the back bumper, driving at speed through rush hour traffic. 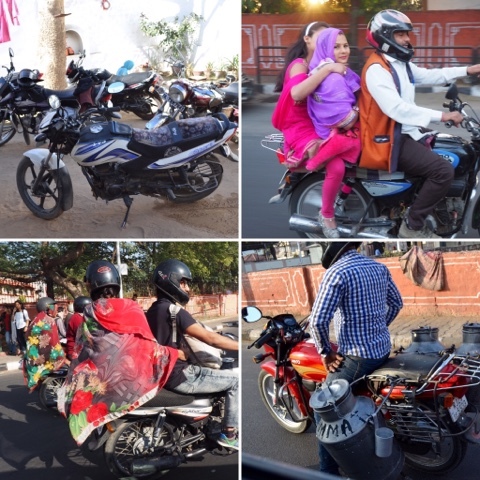 It seems obligatory to have at least three people on a motorbike, often a sleeping child squashed between the driver and a woman in a sari sitting sidesaddle on the back (how do they stay on?). 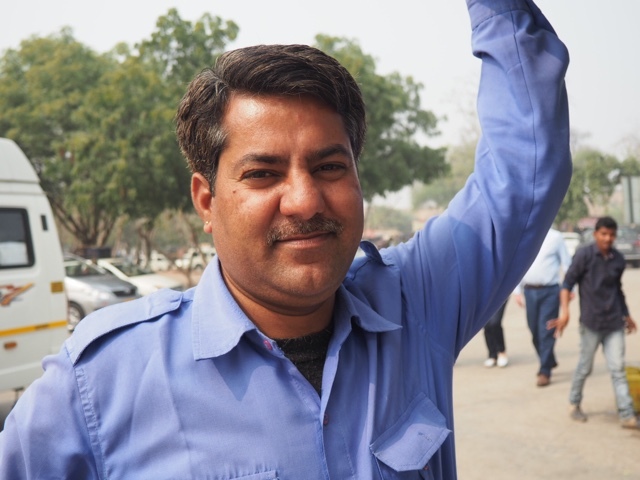 Although there is a 200 rupee fine for each extra person over two, and for each person not wearing a helmet, it seems that it would be impossible to enforce it. 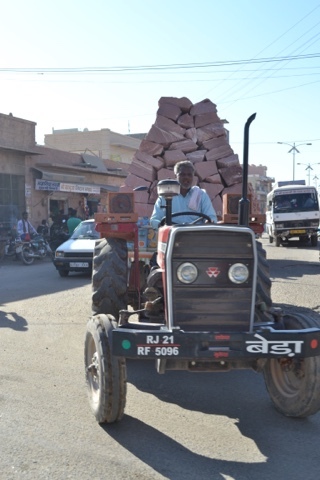 When not loaded with people they are also a good way of carrying goods - the milkman above is relatively conservative with his load; we have see six foot blinds being carried vertically by the pillion passenger, huge bundles of straw, poles and wood twice the length of the bike . . . The list is endless. All loaded to the hilt - often needing extra helpers to push. But some are carefully loaded - it's almost an art form for these trailers in the quarry towns. 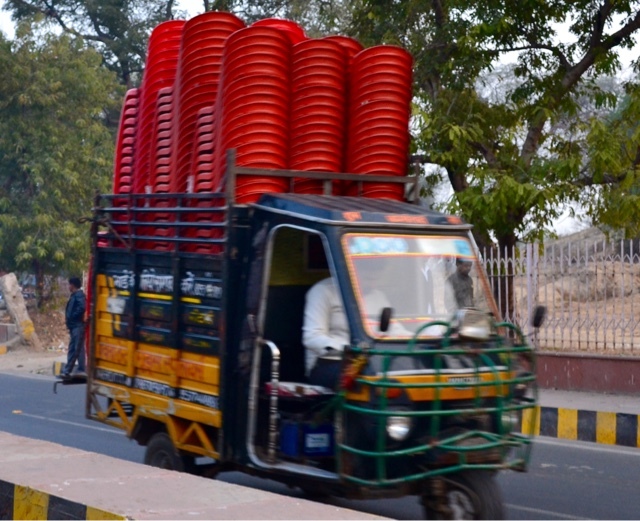 No-one uses indicators - some auto-rickshaws and small trucks don't even have any. 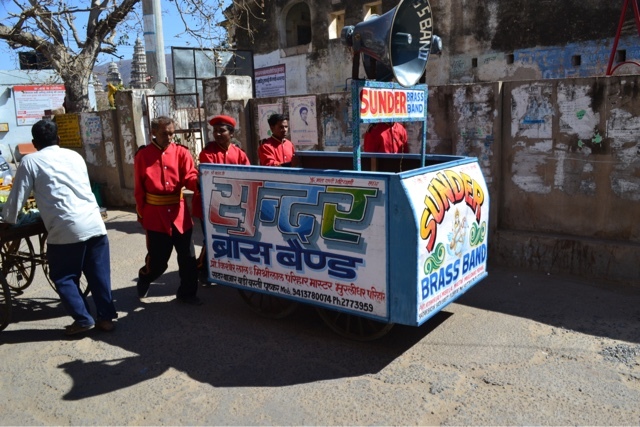 The horn is used constantly as an indicator-substitute, or to say 'coming through', 'watch out', 'move over', 'get out of the way' etc. so there is a constant cacophony. Turning right involves forcing your way at speed into the oncoming traffic, everyone ignores roundabouts, the central reservation is often used as a footpath and if you want to cross the road you take your life in your hands. That doesn't stop hoards of people and assorted livestock from doing just that though! In smaller towns and villages animals think it's fine to sleep in the middle of the road - people generally drive around them, or just honk their horn till they move. 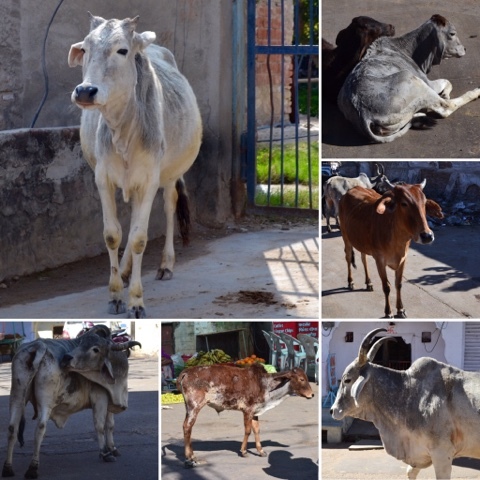 Sacred cows (along with oxen, buffalo and dogs) wander at will through the streets, are fed and protected by everyone, and have right of way on the roads. If one becomes sick there is apparently a dedicated veterinary service for them. 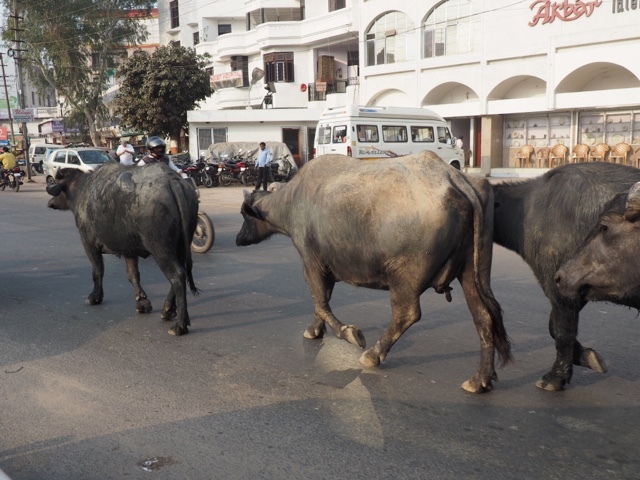 We saw these buffalo in Agra, wandering nonchalantly down the middle of the road at about 4pm. Our guide said they were going home - apparently they take themselves from the farmer's house to water every morning and walk back every evening, totally unaccompanied. 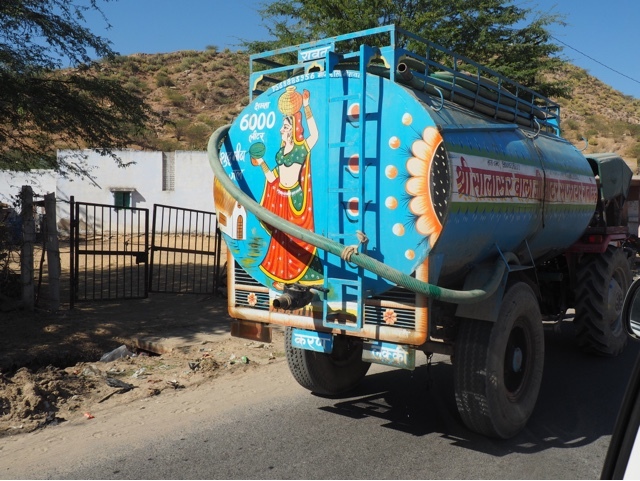 All sorts of commercial vehicles have hand-painted signs and decoration; the blue tanker is a water tanker, below a band for hire. 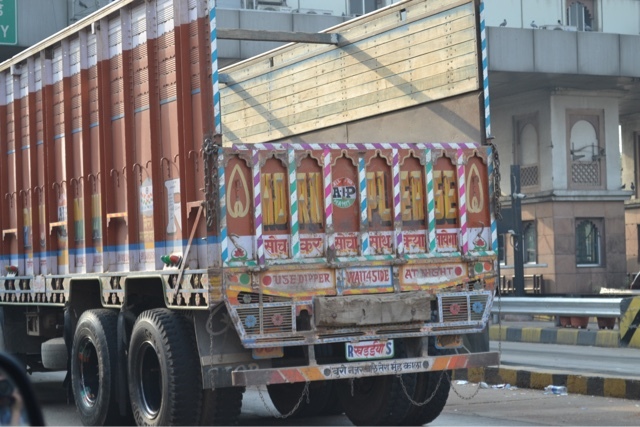 The one saving grace is that lorries aren't allowed into Delhi until after 8pm. All those that we've seen are hand painted with all sorts of patterns as well name of the business and the inevitable request to use 'horn please'. 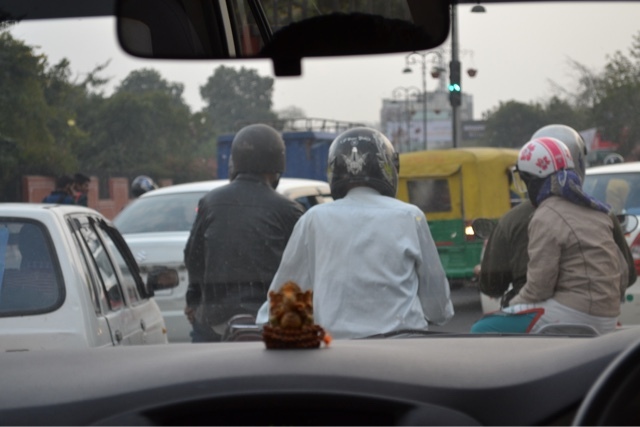 Apparently, there is so much traffic on the roads in Delhi that a rule was introduced last year whereby you can only drive your car on certain days, depending on whether the number plate ends with an even or odd number. Public transport vehicles have to use environmentally friendly fuel and there are bus lanes (usually full of pedestrians and aminals). Out of the city toll roads are the way to go, but only to be found on major routes. 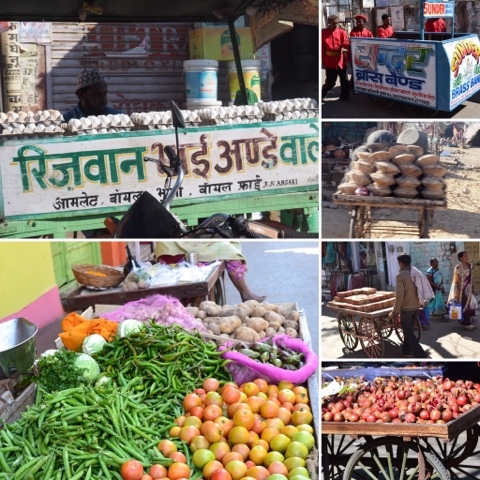 Having experienced a 'single road' yesterday on the way from Pushkar to Jodphur, with random and vicious sleeping policemen, little surface in places and cobbles in others I don't think I'm going to complain about potholes on Hampshire roads again! Aren't we glad we had a driver to negotiate all of this!